Many different types of plants thrive in salty soils and saltwater conditions. Most are found in salt marshes, which serve as a transition zone between ocean and land. Plants found in these areas are salt tolerant and have successfully adapted to fluctuating water levels that change with the tide. Plants such as salt cord grass and sea lavender help make up the diverse ecosystem that is present in salt marshes. These plants are able to handle the extreme fluctuation of water, salinity, oxygen and temperature and are generally found in coastal regions across the United States. Salt cordgrass is a perennial grass typically reaching heights between 1 and 3 feet. The grass blades are green but produce blooms in April and May in shades of yellow. Salt cordgrass prefers full sun and lots of water for optimal growth. It does well in wet and sandy soils and is tolerant of salty conditions. 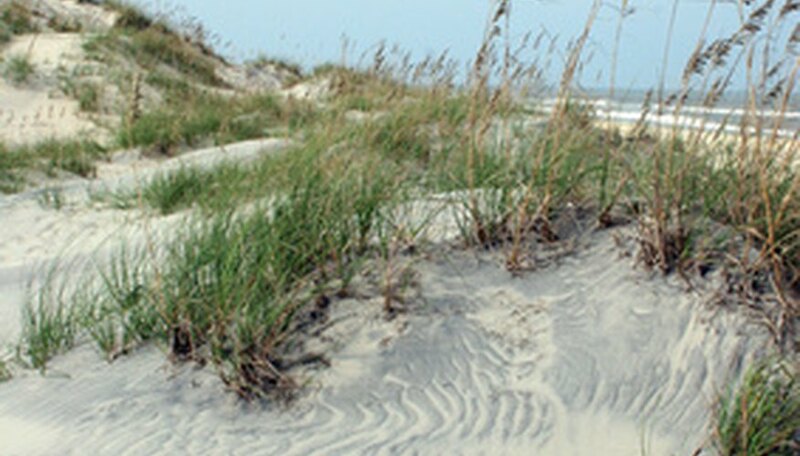 Salt cordgrass is typically used as a stabilization plant in beach fronts and is known to attract birds. It also does well in freshwater conditions, and if grown in freshwater regions, will grow taller. Salt marsh dodder is a perennial vine prevalent in salt marshes along the Pacific coastal regions of the United States. Dodder typically features leafless stems with a twine-like growth. It is considered a parasitic flowering plant and will attach itself onto neighboring plants. Salty Susan is a low-growing perennial marsh plant. It reaches heights up to 6 inches and has a spreading nature. Fleshy and shiny leaves appear on long stems. Salty Susan produces rather small yellow blooms similar to the sunflower. It occurs only in saline regions and is common among salt marshes. Salty Susan is also known as fleshy jaumea. Sea lavender is a flowering shrub found along many coastal regions and salt marshes. It produces attractive silvery blue-green foliage at the end of branches along with small white flowers. Flowers appear year-round on sea lavender. Growth is slow, and the shrub generally only reaches heights up to 5 feet, especially if exposed to salt spray from the ocean. It is often used as a ground cover, and generally spreads 6 to 20 feet in length. Sea lavender does best in regions with full sun exposure and has a high tolerance to sand, salt and drought. It also thrives in acidic and alkaline soil types. Like salt cordgrass, sea lavender is often used as a beachfront and dune stabilization plant.